The Golden Horde of Mongols, led by Genghis Khan, ravaged most of the known world in the 13th century, from China to Moscow and Rome. Everything in between was left in carnage or total surrender. They amassed the greatest treasure ever imagined. Gold and silver from the lands of Islam, the Caliph of Baghdad's private vaults, and art and textiles from the great cities of the Middle Ages. Legend has it that the treasure was buried with their Khan. There were no witnesses, because the burial party was killed to keep it a secret. Through the centuries, searching for the treasure was forbidden because Khan was deified. Its location has remained a mystery. 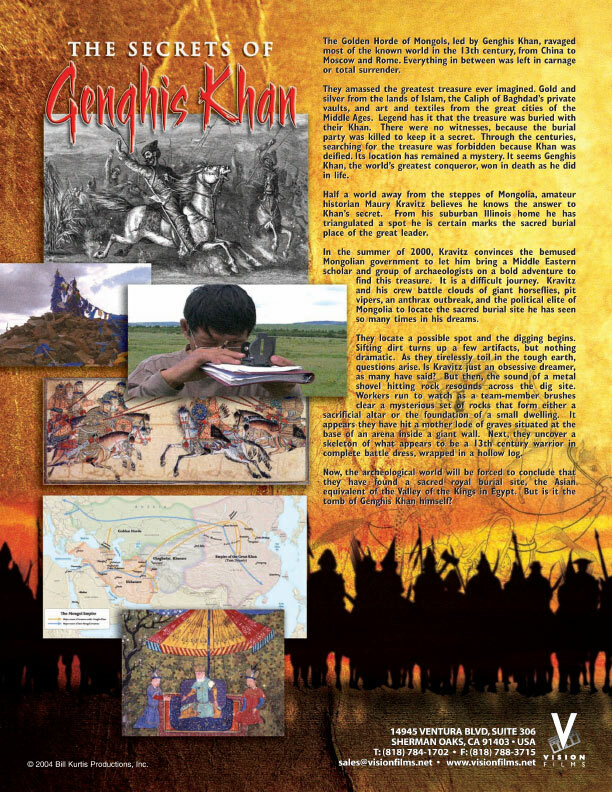 It seems Genghis Khan, the world's greatest conqueror, won in death as he did in life. Half a world away from the steppes of Mongolia, amateur historian Maury Kravitz believes he knows the answer to Khan's secret. From his suburban Illinois home he has triangulated a spot he is certain marks the sacred burial place of the great leader. In the summer of 2000, Kravitz convinces the bemused Mongolian government to let him bring a Middle Eastern scholar and group of archaeologists on a bold adventure to find this treasure. It is a difficult journey. Kravitz and his crew battle clouds of giant horseflies, pit vipers, an anthrax outbreak, and the political elite of Mongolia to locate the sacred burial site he has seen so many times in his dreams. They locate a possible spot and the digging begins. Sifting dirt turns up a few artifacts, but nothing dramatic. As they tirelessly toil in the tough earth, questions arise. Is Kravitz just an obsessive dreamer, as many have said? But then, the sound of a metal shovel hitting rock resounds across the dig site. Workers run to watch as a team-member brushes clear a mysterious set of rocks that form either a sacrificial altar or the foundation of a small dwelling. It appears they have hit a mother lode of graves situated at the base of an arena inside a giant wall. Next, they uncover a skeleton of what appears to be a 13th century warrior in complete battle dress, wrapped in a hollow log. Now, the archeological world will be forced to conclude that they have found a sacred royal burial site, the Asian equivalent of the Valley of the Kings in Egypt. But is it the tomb of Genghis Khan himself? 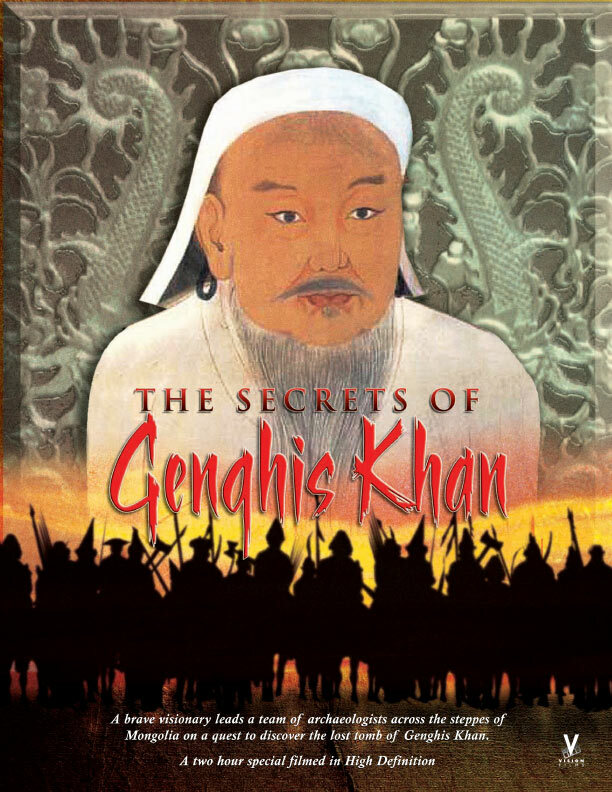 Legend has it that Genghis Khan, the greatest warrior who ever lived, is buried in a hidden location with his plundered treasure: gold and silver from the lands of Islam, the Caliph of Baghdadâs private vaults, and art and textiles from the great cities of the Middle Ages. Join a team of explorers across the steppes of Mongolia on their adventurous quest to unearth one of the world's greatest mysteries.